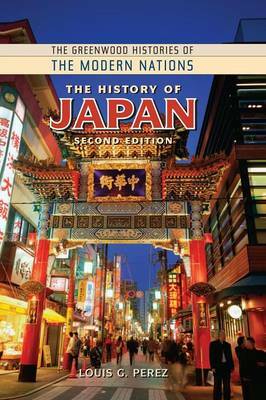 Louis G. Perez revisits Japan's turbulent past and recent events in the past decade and 21st Century in this revised and fully expanded second edition of The History of Japan, a must-have for all high school and public libraries. This essential resource provides readers with a comprehensive look at Japan's long and rich history, examining its politics, culture, philosophy, and religious beliefs throughout the ages. Also included are up-to-date discussions of political situations, environmental issues, and even a glimpse into the cultural lives of the Japanese today. Students will learn who the Japanese are today, and how the past has shaped their contemporary society. An updated timeline, appendices, and glossary, along with an illustrative bibliographical essay that includes both print and electronic sources, round out this valuable reference tool. Roughly the same size as the state of California, the island nation of Japan is one of the world's most densely populated nations-not to mention an economic powerhouse and a mecca of advanced technology. But the Land of the Rising Sun did not always lead the world with its success in the automobile industry, innovative electronics, and powerful stock market. Louis G. Perez revisits Japan's turbulent past and recent events in the past decade and 21st Century in this revised and fully expanded second edition of The History of Japan, a must-have for all high school and public libraries. This essential resource provides readers with a comprehensive look at Japan's long and rich history, examining its politics, culture, philosophy, and religious beliefs throughout the ages. Also included are up-to-date discussions of political situations, environmental issues, and even a glimpse into the cultural lives of the Japanese today. Students will learn who the Japanese are today, and how the past has shaped their contemporary society. An updated timeline, appendices, and glossary, along with an illustrative bibliographical essay that includes both print and electronic sources, round out this valuable reference tool.